My grandfather passed away Sunday at the age of 89. I was asked to write up a remembrance of him, based on the writings he left behind. My grandfather on his wedding day. A series of fortunate events gave Merle Elmer Brann the opportunity to meet the love of his life. And unlike Rhett Butler, the dashing rogue from his favorite film Gone With the Wind, he didn’t allow his Scarlett to slip away. When he enlisted in the U.S. Army in 1940, a year after graduating from high school, a chance conversation with a friend in a hallway delayed him from signing up the day he had intended. It also kept him from a tour of duty in the Philippines, from where very few returned. Mr. Brann finished basic training at Camp Jackson, S.C. (later renamed Fort Jackson), and, as a member of the 20th Regiment of the 6th Infantry Division, he participated in the largest peacetime maneuvers in Army history. Stationed on Kodiak Island, Alaska, he was involved in an automobile accident while on guard duty. His head and shoulder injuries were so severe the doctor assumed he would die and didn’t clean the wound. Yet fortune smiled yet again—although he remained in the hospital for ten weeks, Mr. Brann fully recovered. Years later, gravel pieces from the road would still appear on his scalp, a reminder of that fateful night. He declined a medical discharge, based on the accident, out of feelings of duty and loyalty. He didn’t want to leave his men. Promoted to Staff Sergeant, he was sent to school to receive training in Army Engineering Training School as a camouflage instructor. 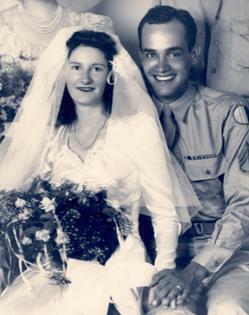 June, 7, 1945, he met Josephine Agnes Sutton in a Washington, D.C., nightclub and, luckily, they happened to share a bus headed the same direction. They struck up a conversation, and he offered to visit her hometown the next day. Both knew there was something special—maybe even love at first sight—but time was short. His school was ending in less than two weeks. Afterward, he expected to be sent to California, clear on the other side of the country. So he mustered up his courage and proposed marriage on Wednesday, June 12. One day after school ended—just three weeks after meeting—they wed on June 23 at Saint Paul’s Episcopal Church in Alexandria, Va. Pressed into quick service, most of his groomsmen were fellow members of the Army. Most of Josephine’s family attended, though travel during the war was difficult. Maybe he wasn’t exactly Rhett Butler. Maybe she wasn’t Scarlett. But, in the end, together they embarked on the greatest of adventures: 65 years of wedded bliss. In his later years, he struggled with lymphoma and lung cancer. Through it all, he always kept his good humor and sunny disposition, his faith and family ties. He passed away on March 27, 2011, at the age of 89, surrounded by his children and—of course—Josephine. It was the right ending for a romance too good for the silver screen. Five Writers Answer: “Why Write?